The show exhibited by deciduous trees in the autumn is triggered by multiple ambient and chemical factors. 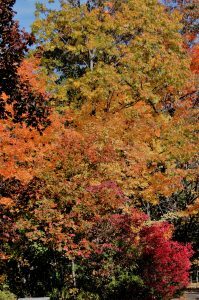 Most people associate the splendor with cooler temperatures but in fact there are many different factors attributing to both the color change and the loos of foliage. The process is an intricate dance of events beginning with the deciduous trees’ growth cycle. Most of these trees have a very short period of annual growth from stemming from overwintering buds. But the days must become long enough and the weather warm enough to support new growth. Most trees in the northern hemisphere have completed their annual growth by late June. The next year’s leaf buds are also set at this time. And will not open until there is enough of a chill for a long enough time followed by certain warm temperatures and certain amounts of daylight. These days are called GDD’s (growing degree days) which coerce and modify all kinds of organism’s behavior. Think of it as Mother Nature’s internal clock. Oddly enough, it is not the daylight that triggers growing habit, it is the length of the dark period which prompts the cells near the juncture of the leaf and the stem to divide rapidly, but without causing expansion. This abscission layer is a corky layer that blocks nutrients such as carbohydrates from being absorbed from the leaf to the branches. It also blocks the flow of nutrients and minerals from the roots to the leaves. During the growing season, chlorophyll is constantly being replaced in the leaves. Chlorophyll breaks down with exposure to light so it must be manufactured constantly. When production of chlorophyll ceases and the connection between the leaf and the rest of the plant, the chlorophyll disappears. Thus when the color of the leaves change, it is not that the leaves are turning orange or red, they are losing chlorophyll. During the summer, the chlorophyll masks the yellow pigments of the leaves (xanthophylls) and the orange pigments (carotenoids) which are exposed once the chlorophyll has ceased production. Red and purple pigments are manufactured in a different process involving anthocyanins and sugars trapped in the leaves. As the season progresses, the cells in the abscission layer become dry and more cork like, causing the leaves to break off. Like chlorophyll, the other pigments break down with light exposure or are frozen leaving only the tannins, which are brown in color. Dark hour length is by far not the only factor, it just heralds the beginning of the process. Temperature, sunlight, soil moisture as well as the GDD’s will influence the quality of the foliage display especially after the abscission layer has been formed. An early frost will destroy the machinery responsible for manufacturing anthocyanin. Drought can also trigger the early formation of the abscission layer. The best weather conditions for a jubilant color display an wet growing season (spring) to early summer), followed by a dry cool autumn marked by warm days and cool but frostless nights will be rewarded with the best color show. Here is the kicker. While the whole process of fall color is fairly well understood, the reason for it is less clear. Xanthophylls and carotenoids play an important role in photosynthesis by helping to capture light for carbohydrate manufacturing processes. The benefits of anthocyanins are not understood. Some etymologists postulate that the purpose of the plant’s evolutionary response is to warn pests. Other scientists believe that anthocyanins serve as a sunscreen to inhibit the loss of chlorophyll. Or perhaps to prevent frost injury to leaf tissues, or perhaps to limit water loss during dry spells. It would seem more evolutionarily beneficial for the species to remove all the carbohydrates they can muster from the leaf before letting it fall to the ground. If this were the case we would not see the red and purple pigments in say – a sugar maple. So it is clear that the orange and yellow pigments are born from a completely different mechanism than the reds or purples. Who knew? So the process embraces multiple factors. Many are consequential but how they interact defines the behavior of the organism. As a member of the human organism species. It is apparent that my growing habit, my triggers to manufacture necessary nutrients, and my abscission layer shedding unnecessary baggage in favor of setting up future growth is dependent upon many factors – most of which are out of my immediate control. Also as a human, I am compelled to believe that in my infinite wisdom, I can recognize the extraneous factors and how I am affected by them. If that were the case, I could measure and modify my GDD’s to suit a more robust growing season. Alas, that turns out not to be the case. I am positive that the deciduous tree has a better grasp of the situation.